If all goes as planned, Philadelphia’s only majority black building trades union and one of the only construction unions with a majority of members who live in the city will soon move its training operations from Exton in Chester County to North Philly. The proposed Laborers’ District Council of Philadelphia and the Vicinity facility would rise on North Broad and Thompson streets on a piece of Temple University land formerly occupied by William Penn High School. The Yorktown site is now an athletic field. At a community meeting held this week, union officials presented renderings of a $25 million, 36,000-square-foot facility to a few dozen residents and described the benefits it could bring to the neighborhood. The jobs performed by the union’s members are generally the less-complicated tasks on construction sites and pay lower wages than building trade union workers such as electricians, ironworkers or plumbers. The center would include two large training bays where workers will learn how to remove asbestos, dig trenches, erect scaffolding and build houses. Twenty percent of the union’s training operations will remain in at the current Exton location, because of space constraints at the proposed 1333 Broad St. site. The new training center would cover about half of the land occupied by the high school, which Temple demolished in 2014 after purchasing for $15 million. The university plans to sell the site to the Laborers for $3 million. It takes nearly an hour to get to the Exton center from the union’s North Philadelphia headquarters, assuming there’s no traffic. Making the trip on public transit requires at least one transfer and would take upwards of two hours. Some trainings require attendees to stay at dorms on site for a week or more. The inconvenience for Philadelphia-based workers leads to sometimes disappointingly low registrations, said Sam Staten Jr, business manager for Laborers’ Local 332, one of two city-based Laborers locals in Boyer’s district council. “We were looking back in our history and seeing that the school is just not well enough attended,” said Staten Jr., who estimates that 90 percent of the Philadelphia Laborers union members live in the city and that as many as 40 percent live in close proximity to the proposed training site on North Broad. The Exton center dates back to the 1980s. Sam Staten Sr, former 332 business manager, helped plan the purchase of the land and the construction of the suburban campus. But times have changed, said Boyer. Union members have more responsibilities at home, which makes it harder for them to make the long trek outside the city. In addition to providing training for Laborers apprentices, the union also plans to give trainees the skills to become members of the other building trades unions. Many of the other construction union in the city have a long and troubled history with racial exclusion, and diversifying these skilled and high paying blue collar jobs is a frequent point of contention in local politics–including in Mayor Jim Kenney’s $500 million Rebuild initiative. Staten Jr. told the crowd that minority hiring provisions in labor contracts sometimes go unfulfilled if there are not enough African-American workers with the necessary skills when the call for work goes out. 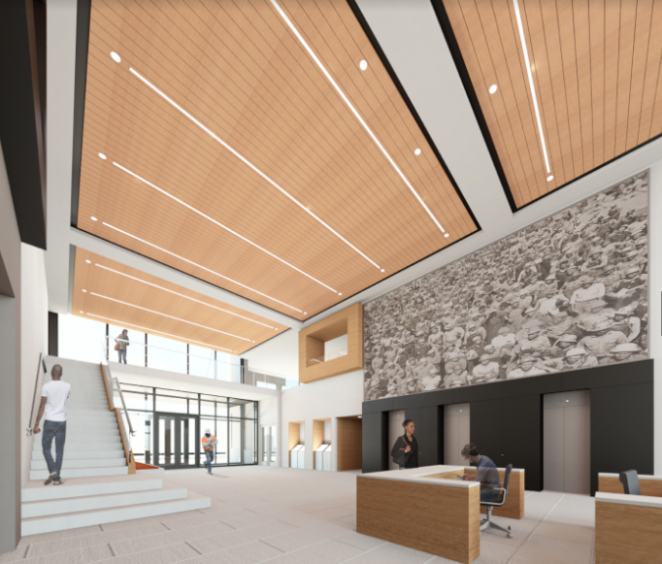 In addition to the two training bays, the building will also include lecture halls, meeting rooms, and a cafeteria. The union plans to partner with Temple on academic offerings including classes in math and literacy as well as GED and ESL courses taught by student teachers. For the crowd at Tuesday’s meeting, the plans sounded good. The one sticking point was Temple’s involvement in the project. For much of this year, the university has clashed with area residents who bristle at a plan to install a football stadium in the middle of their neighborhood. The stadium is currently at a stalemate. The Laborers said that Temple would allow their project to use the whole of the former William Penn site as a staging area, as long as they replant the grass when the work wraps. Union officials told the crowd that the university assured them that whatever is ultimately built on the rest of the site would be complementary to the training center. The statement drew guffaws from the crowd. Woods went on to say that the area is undergoing a development boom, and while she likes the Laborers plan she fears that Temple will want to erect another towering building on the second half of the site. The meeting concluded with neighbors asking the Laborers Union to sign a community benefits agreement with the neighborhood, guaranteeing access to meeting rooms for community group and training for residents. Boyer and Staten Jr. readily assented and said they wanted to have more meetings with the community moving forward. A variety of neighborhood politicians also attended the meeting, including City Council President Darrell Clarke, state senator Sharif Street, and state representative candidate Malcolm Kenyatta. None of them spoke. Clarke’s support will be needed for the project to move forward. Because the site sits within Temple’s special zoning district, it must be remapped for commercial development as CMX-3.